The sailfish is amongst the fastest of all fish, possibly the fastest. Clocked at speeds of up to 70mph and inhabiting the deepest blue water, the sailfish poses a challenge for any diver. We must stress that the sailfish is dangerous to divers once speared and should not be hunted unless you are prepared for a potentially lethal counterattack. Sailfish look similar to Marlin but are slimmer and slighter. 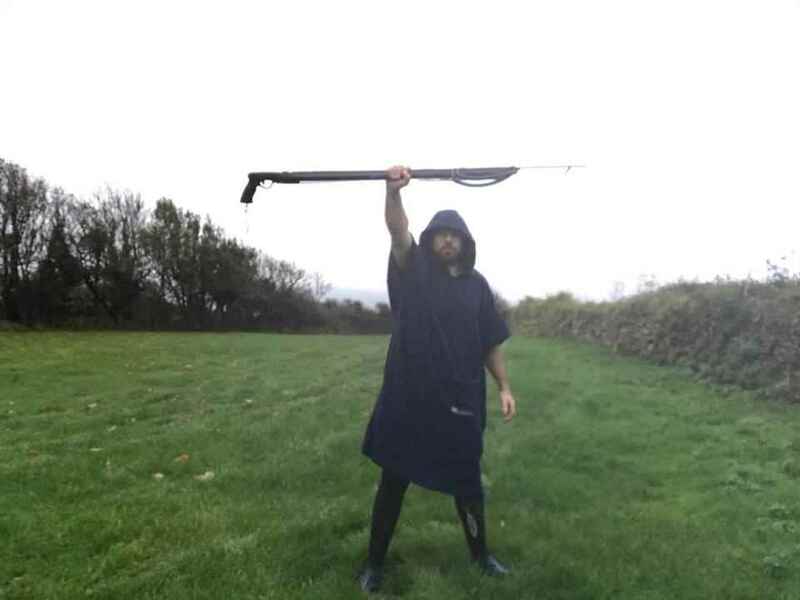 Nonetheless they are substantial fish and armed with a very long sharp bill. Fish tend to be 60-100 pounds with bigger specimens up to 125 pounds plus. The sail on the back is raised to signal and to herd small fish. Sailfish can be found in deep warm water in the Pacific and Atlantic oceans. Diving seabird activity is an ideal indicator that sailies are in the area… sometimes you can see their sails on the surface as they circle a bait ball… exciting moments as you set up your approach! The main problem is finding one! Living far from land in deep water they are not encountered casually. The approach can be problematic as sailfish have excellent spatial awareness. Approaches from the rear do not seem productive. Blindside attack did not yield a single fish for us in 70 contacts. A head on approach works best. Aim directly towards the fish, and as it swings its head back and forth, swing with it so it never gets a view of your side profile… keep this up and you will both close distance quickly. Then one of two things will happen- the fish will move off just out of range or it will do one more swing and you will get a flank shot. 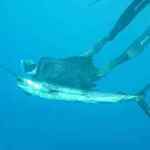 On hitting the sailfish it will take off fast, either down or along the surface. You need a good float rig and to let them run. The fish has much more stamina but a similar pace to a wahoo. Think wahoo crossed with tuna and you have the general idea. Bringing in a sailfish too ‘green’ is very dangerous as they will often attempt to spear a diver (entirely reasonable!). Having narrowly evaded a couple of angry sailfish we would advise great caution in the final stages of the fight and to use a second shot if available. Although it does not have teeth, the bill of a sailfish is a formidable weapon. 10/10 – The sailfish is fantastic eating. Cook as follows: Marinade the steaks in olive oil, lemon and black pepper mix. Cook on a pre heated skillet pan and sear each side for 2 minutes. Remove from pan and place on foil in pre heated over at 200C. Roast for 7 minutes. Done. Boom! Enjoy! Without a doubt the weapon to hunt this fish is the Rob Allen Zulu Carbon Railgun, with double 16mm rubbers and a 7.5mm shaft, double wrap 400lb mono. A 140cm Tuna Railgun makes a perfect second shot gun and we had these attached to our terminal floats. 6 Sailfish were caught with this rig in 5 days in March 2012.